Opposition leader Juan Guaido, who has declared himself the interim president of Venezuela, speaks during a press conference on the steps of the National Assembly in Caracas, Feb. 4, 2019. The recognition by several EU countries of Juan Guaidó as acting president of Venezuela this week may further isolate Nicolas Maduro but the hesitation of some European leaders to back the move may have bought Maduro valuable time in which to mobilize and step up repression against his opposition, observers say. When Guaidó invoked his constitutional powers as president of Venezuela's congress to declare himself acting president on Jan. 23, he drew immediate recognition from U.S. President Donald Trump and 14 Latin American governments who have long denounced what they condemn as Maduro's moves towards dictatorship. President Donald Trump this week said U.S. military intervention remains an option. 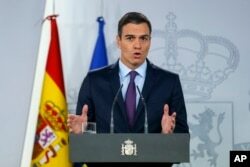 EU countries waited until Feb. 4 when Spain's socialist prime minister Pedro Sánchez delivered a cautious statement recognizing Guaidó as "caretaker president" while insisting on "elections in the shortest time possible", safeguards against "external intervention" in Venezuela and a "multilateral contact group" to open a dialogue with Maduro. Spain's Prime Minister Pedro Sanchez delivers a statement at the Moncloa Palace in Madrid, Feb. 4, 2019.Sanchez told reporters "we are working for the return of full democracy in Venezuela." 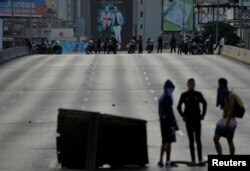 "Maduro has had 12 days in which to regroup and step up repression. There have been killings on the streets, arbitrary arrests and even an attempt to arrest legitimate interim president Juan Guaidó" said the leader of Spain's conservative opposition Popular Party (PP), Pablo Casado, who has demanded that Sanchez to appear before Spain's congress to "give explanations." Spain has been the EU's reference point for Venezuelan policy due to its extensive historical, cultural and commercial ties with its former colony. Other EU leaders had deferred to Sanchez on the decision to give official backing to a self-proclaimed leader who was largely unknown and attacked by Maduro as a U.S. lackey. Sanchez gave Maduro an 8-day period in which to call elections before recognizing Guaidó. Maduro refused to accept what he called "ultimatums" and has spent the last several days visiting army garrisons to underpin support from the military who are the main pillar of his regime. Soldiers invaded Venezuela's congressional building on Tuesday, according to news reports. Maduro's ruling PSUV party also organized a mass rally in Caracas where the embattled president spoke last Sunday to eclipse opposition marches led by Guaidó. 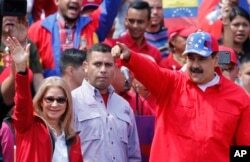 President Nicolas Maduro and first lady Cilia Flores greet supporters as they arrive at a rally in Caracas, Feb. 2, 2019. Maduro's secret police, SEBIN, has arrested about 1,000 opposition activists and a number of foreign journalists over the past two weeks, according to human rights organizations. Hundreds of Russian advisers described by Kremlin officials as "military contractors" have also been arriving in Venezuela for the apparent purpose of protecting Maduro. An ex-colonel in Colombia's military intelligence service, Juan Marulanda, now an international security consultant, has told VOA that they are special forces being assigned to elite Venezuelan units to boost their capacity to resist a possible coup. A Russian government spokesman said that Europe's recognition of Guaido could provoke "civil war." Maduro has said he is in the process of arming political militias called Colectivos with high-powered weapons supplied by the armed forces. Despite clear signs that Maduro is digging in, EU foreign policy chief Federica Mogherini is exploring possibilities for a negotiated settlement. She has refrained from recognizing Guaidó and has instead promoted an international contact group due to meet in Uruguay on Thursday to seek a peaceful and democratic solution to the crisis in Venezuela. Demonstrators are seen with the security forces behind them during a protest against Venezuelan President Nicolas Maduro's government in Caracas, Venezuela, Feb. 2, 2019. Some European countries including Italy and Greece have not recognized Guaido and called for direct talks with Maduro. The U.S. position expressed by Vice President Mike Pence rules out any dialogue. Spanish diplomats say that the Trump administration is influenced by Venezuelan opposition leaders who are highly critical of a former socialist prime minister who mediated in previous negotiations with Maduro which they say Maduro tried to use to legitimize his reelection in a sham poll. The father of opposition leader Leopoldo Lopez, who has been imprisoned by Maduro, said on Spanish television Monday that it was "senseless" to expect free elections in Venezuela under current electoral authorities which are controlled by the regime. "The United States is convinced and has let us know that there is no room for more mediation or facilitating further conversations with Maduro," Spanish foreign minister Josep Borrell told Spain's parliament last week. Press reports said Madrid has yet to grant diplomatic status to the ambassador Guaidó has designated. According to the Spanish newspaper El Pais, the U.S. ambassador in Madrid, Duke Buchan, met with Borrell hours before Guaidó proclaimed himself president of Venezuela Jan. 23 to urge the Spanish government to close ranks with the U.S., Canada and the Organization of American States. But the Sanchez government is also influenced by the far left Podemos party on which it relies for critical parliamentary support. Podemos spokespersons have often praised Maduro and criticized the decision to recognize Guaidó as dangerous. Sanchez has said that his main concern is the well being of about 150,000 dual Spanish nationals who live in Venezuela where major Spanish companies including oil giant Repsol and Banco Bilbao Vizcaya are heavily invested. Italy's oil company Eni also has investments there. A new test of Europe's solidarity is expected in coming days as international efforts get under way introduce humanitarian aid to Venezuela. Spain, Germany and other EU countries have pledged to lead the effort which Maduro has vowed to block, calling it a "Trojan Horse."